“Look! See how tall my tower is!" “Wow! How many blocks to you think you have there?" “1,2,3,4,5,6,7,…8! I have 8 big blocks that make my tower so tall!" 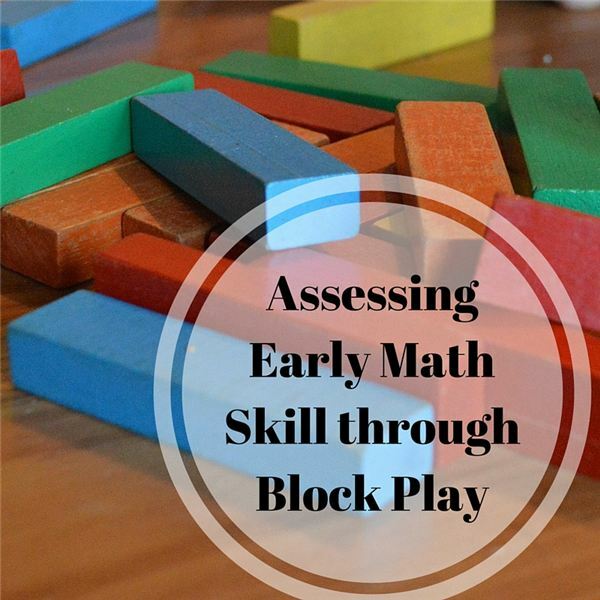 Block play is an essential part of a preschool or kindergarten curriculum because it supports all areas of mathematical learning. In the information below, examples of appropriate activities and assessment strategies will be provided for teachers in each preschool math standard recommended by the National Council of Teachers of Mathematics (NCTM). Using blocks, children can understand number and quantity in many ways. Try having the child place one block on each block you lay down. This is known as one-to-one correspondence; the concept that each block counts as one object and can be equally matched with another. All other math skills build upon this foundational math skill. Other ways to assess this skill is to observe children beginning to quantify which tower has more or less blocks, and recognizing how many 5 blocks is, without having to count each individual block. While stacking and taking off blocks, be sure to use math language to describe adding and subtracting while helping the child count and understand the final number represents the whole. Provide blocks of various attributes to introduce and assess algebraic thinking such as matching, sorting and beginning patterning. This can be accomplished with the use of colors, shapes, sizes, etc. In addition, use blocks of various colors or shapes to model AB patterns to start; increasing in difficulty as the child demonstrates mastery. Blocks are the perfect tool for this concept. Observe how the child copies, and then extends the pattern during child-led play experiences. Lastly, use math language terms such as before, after, and next while seriating objects according to size. Observe children while they attempt to order their blocks. This is an effective way to assess for mathematical understanding. Using blocks of different shapes is a great way to plan for and assess early geometric play experiences. Providing many types of triangles for example, lets children gain an understanding that no matter the size of the triangles, they share the same basic properties, that they all have three sides and three points. In addition, provide other physical models of simple solid shapes, including cubes, cones, spheres, rectangular prisms, and triangular prisms to allow for exploration with a wide variety of shapes. Are the children able to notice and describe the differences among the materials? Taking photos of pre-made structures and presenting it as a model for the children to attempt to re-create is a great way for them to explore the properties of spatial awareness. Use blocks as a unit of measurement! For example, “How many blocks long is the fire truck?" Introduce mathematical terms such as longer, shorter, more, less and equal. Another way to explore measurement with blocks is to incorporate a balance scale. Adding blocks to each side to see what happens is a way to make learning about measurement entertaining and meaningful. It provides practice with the measurable attributes of weight and an opportunity to assess their knowledge of and skill in understanding mass. Use terms such as heavier and lighter. Do the children demonstrate an understanding that an equal number of blocks on each side make the balance level? Can they add blocks to one side when the other side is heavier? Estimating, graphing, and collecting and displaying data can be a fun way to introduce data analysis and probability to young children. Build a large structure and have the children estimate how many blocks are being used. This a great way to assess a child’s understanding of quantity by taking note of the numbers they guess …5…100….5,000! Be sure to count the blocks by assigning each one to a number as you take apart the structure under their observation. Placing them in a separate container as you name the number helps to reinforce the concept of 1-1 correspondence in a natural and meaningful way. Also, have the children graph with the blocks by printing out and taping their pictures onto the smaller side of the blocks. Find various ways to use these blocks as a hands-on activity to answer numerical questions and place them on top of each other to represent a bar graph. Have the children count each block and analyze the information (How many children have an E in their name?). Lastly, use a color spinner while building with colored blocks. The children can spin the spinner to see what color block they will add next. This is a great way to review peer-to-peer interactions and turn-taking skills as well. All areas of mathematical learning can be fun and meaningful with the use of blocks. From beginning skills to more advanced learning, blocks play an integral role in the learning and development of young children. Remember to guide children’s learning with leading questions and think-alouds to spark their minds.